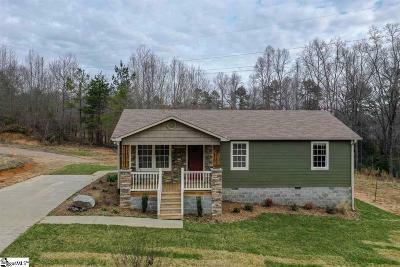 Welcome to 450 Lindsey Lake Road located in beautiful Travelers Rest. Enjoy country living while only being minutes from growing, quaint downtown Travelers Rest and the Swamp Rabbit Trail. Adorable 3 bedroom/2 bath house craftsman style house on 3 acres of land! Enjoy quiet nights and mountain views on the rocking chair front porch that&apos;s beautifully accented with stone. As you walk through the front door you are welcomed by a spacious living room filled with hardwood floors that stretch through most of this cute home. The kitchen has recently been updated with beautiful ceramic tile, granite countertops, and stainless steel appliances (including a fridge). Enjoy your morning cup of coffee in the breakfast nook as you look out into your private wooded 3 acres of land. The bathrooms have also been recently updated and feature new cabinetry and granite countertops. This precious home has a spacious master bedroom with a full bath. You will love the privacy of your personal wooded oasis that is lined by a small creek. Spend nights under the stars away from the city hustle and bustle.